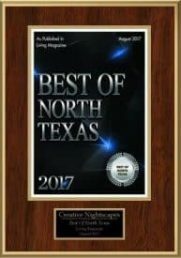 Continuing a tradition of excellence, North Richland Hills-based Creative Nightscapes has once again been named Kichler Lighting’s Contractor of the Year. This award recognizes excellence in professional landscape lighting design, installation, and service. 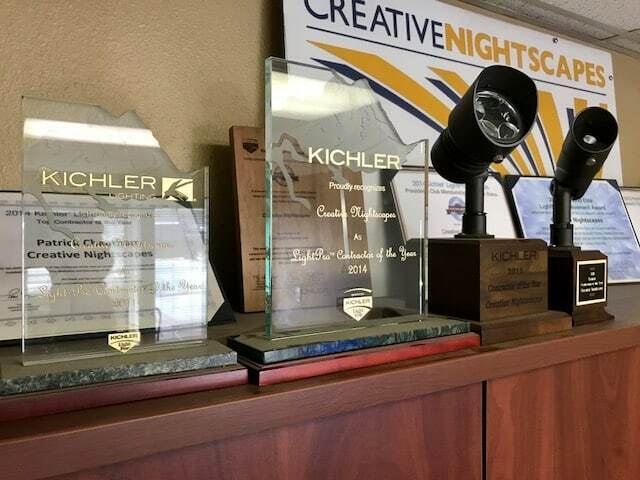 This is the second time Creative Nightscapes has achieved Kichler’s top honors – their first being in 2014. Along with these two top honors, Creative Nightscapes has also earned many Regional Contractor of the Year awards from Kichler Lighting. These are in addition to their many other accolades, including the Angie’s List Super Service Award in 2018 and other past years, the Best of Fort Worth Award for 2013, and the Best of North Texas Landscape Lighting Award for 2017. Of all the honors that Creative Nightscapes has received over the years, they are most proud of the consistently positive feedback from consumers. They strive to do work that is beautiful, is professionally designed and installed, and is exactly what their customers want and need. Creative Nightscapes invites you to browse their outdoor lighting gallery for inspiration and to see the quality of their work. When you’re ready to get outdoor lighting installed on your property, contact Creative Nightscapes.